In this commission, I chose to suggest a vintage baseball card through proportion, pose and color, while bringing an otherwise static subject to life with Ty Cobb ducking and reaching beneath and beyond the card’s own borders. 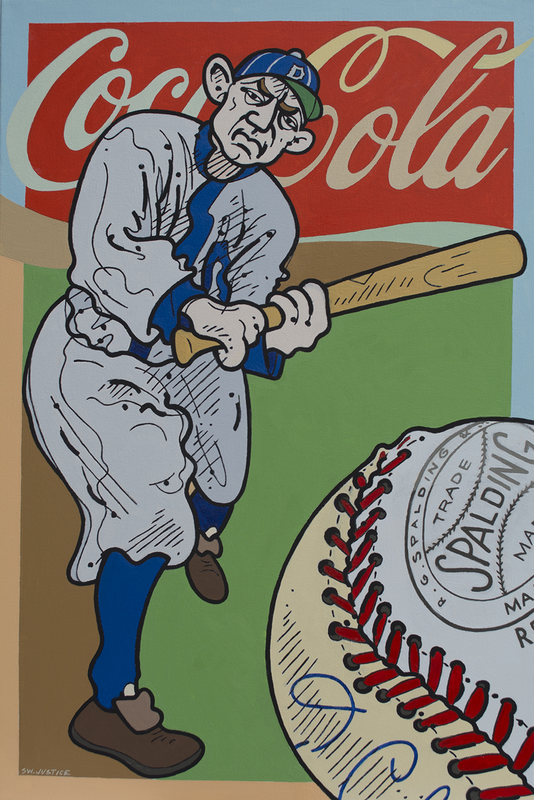 Cobb was as southern as Coca-Cola and was in fact and early shareholder – that logo doubles as a sign at the ballpark. For the daring baseball’s-eye view of the subject I elongated the ball, anime-style, to suggest motion. The large ball appears less monolithic when I use 2 tones, one being the tan of an antique autographed baseball (Cobb’s own signature is suggested here), and the other being the soft sheen of a fresh ball.